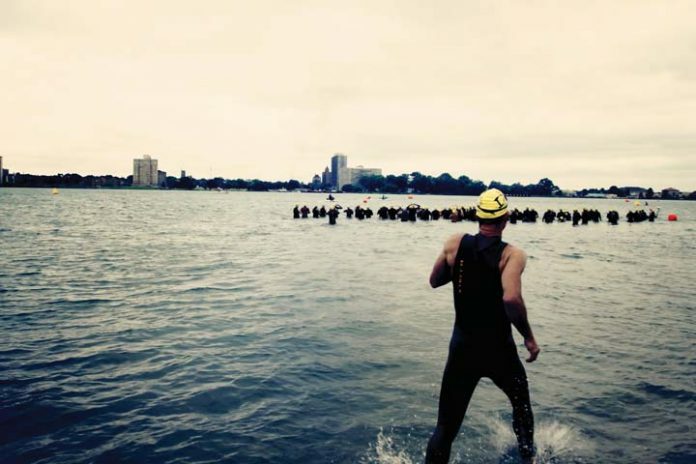 The sixth Motor City Triathlon, held last June 12 on Belle Isle, attracted 600 participants. This year’s event is tentatively planned for June 17, meaning it’s time to start training. Need inspiration? Consider these tips from four triathlon veterans. 20, assistant coach at Fraser Bicycle and Fitness. Keep it simple. Too many participants end up wearing too much in fear of “what-if” scenarios. Triathlons are chaotic with a crowd of participants running around in spandex at 6 a.m. People are warming up, stretching, biking, and running all over while trying to get in the zone. Create a training plan for the upcoming season and decide how many races you’d like to do. Set goals, be open to guidance from people outside of the “tri scene,” and have fun. It’s a flat, fast course, which makes it ideal for beginners as well as more experienced competitors looking to set a personal record. The swim section allows racers to first push hard and swim against the current, and then take a breather and float on the way back to shore. 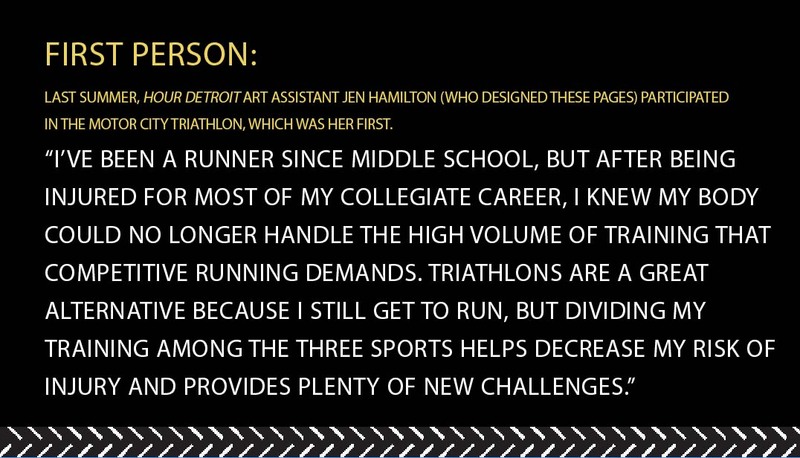 41, a member of Infinite Multisport triathlon club and five-time Motor City Triathlon participant who placed among the top three in her age group in each. The wife, mother, and office manager has been involved in the sport for 12 years. Although she experienced severe hypothermia in last May’s Ironman St. George race in Utah, she participated in the Motor City event one month later and placed first in her age group and among the top-10 females. It depends on current fitness. Shorter distance races can be prepped for with a 12-to-16 week training program. Ritter generally puts in an hour a day and two hours per day on weekends. What you eat matters. Eating as clean as possible leading up to the race can make a difference. Pay attention to race-condition reports. A race director will post updates on weather and water temperatures in the days leading up to the event. Ritter typically wears a race top and race shorts throughout. She adds a wet suit for the swim and brings a few backup items to leave at transition points if there’s a chance of conditions changing. 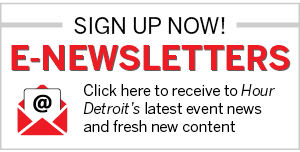 The Detroit River has a particular current and can make for a tricky swim. Getting knocked off course is easy if you don’t do any open-water swim training. 39, advertising executive, participant in nearly 20 races over the last two years. Triathlon suits are the best for races. They’re a single-piece compression fit with a thin bike pad sewn into the bottom. Because trisuits are expensive, consider getting at least a pair of triathlon-specific shorts. “The mass swim isn’t for the faint of heart. There are a lot of arms and legs flying everywhere. 32, a Mercedes-Benz Senior Systems Engineer and an avid runner. Consider starting swim training six months before the triathlon if you have no competitive-swimming experience. An important exercise for triathlon newcomers is a “brick” (running after a long biking session). It’s called that because it feels like your shoes are filled with bricks. Inexperienced swimmers should probably invest in a wet suit if the water is cold enough. It can help with the temperature shock and lends buoyancy, which can add confidence for first timers. Bragging rights: Swimming in the river impresses friends.